The things we are exposed to (situations, but also books, articles, movies, etc..) within the same period of time connect in our heads in ways that might not have happened if we had been exposed to them at different times -- perhaps even six months apart. Here is an example for the past couple of week based on two items I was reading. 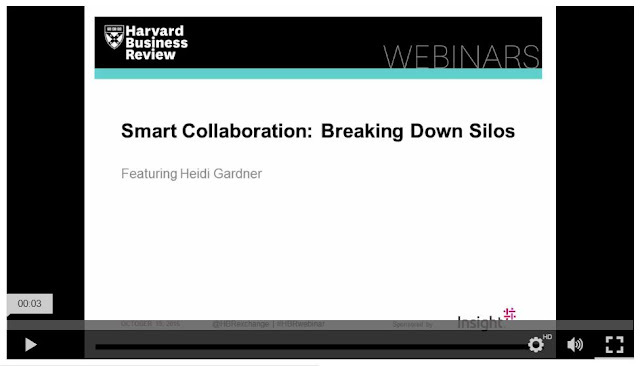 Heidi Gardner, Smart collaboration: How Professionals and Their Firms Succeed by Breaking Down Silos, Harvard Business Review Press, 2017. Click on the screenshot above to go to the webinar page. Summary: Professional services firms need to solve their clients' increasingly complex problems, the kinds of problems that only teams of multidisciplinary experts can tackle. Yet they've organized themselves into narrowly defined practice areas and collaborating across these silos is often messy, risky, and expensive. Gardner shows that "firms earn higher margins, inspire greater client loyalty, attract and retain the best talent and gain a competitive edge when specialists collaborate across functional boundaries." This relates to my own efforts to provide consulting services. My efforts will not resemble those of a large professional services firm, yet the clients might present me with the same set of complex challenges. My own areas of specialization can be perceived as narrow under those circumstances and I want to stick to that as a niche specialty, but organizations are going to present themselves with much broader, more complex sets of interconnected challenges around knowledge management. My main "organizational" challenge as an independent consultant will not be to break down silos but to create collaborative arrangements with partners in order to bring together the capabilities necessary to provide comprehensive solutions to a client when I can't do it on my own. That sounds like a nice challenge/practical research question to address within my first year project. Edgar Schein's Humble Consulting: How To Provide Real Help Faster, Berrett-Koehler Publishers, 2016. Summary: In Humble Consulting, Schein with exactly the same observation as Gardner: Organizations today face challenges that are messy and complicated. Gardner argues that the traditional consultant role of playing doctor just doesn't work in those situations. When presented with a simple, technical problem, the consultant/doctor can come in, run a few tests, come up with a diagnostic and prescribe a treatment or present a solution, but those clear cut situations are rare nowadays. To be truly effective, the consultant must develop an open, trusting relationship with the client, a relationship characterized by authentic curiosity and humility. In the past year, as I have slowly but consistently been planning my return to full-time consulting, I have also read a lot about the consulting business. My previous independent consulting efforts, more than a decade ago, had been professionally very satisfying but I had not proven myself a particularly savvy business person. My initial impression as I considered returning to consulting was that I needed to beef up my business skills and started reading a lot about how to get clients, how to set up consulting contracts, or more generally, how to make a living as a consultant. That was all fine and useful -- to some extent, but I kept looking for something more. I needed to convince myself that I was really going to provide value, not just figure out a way to make a living out of it. I eventually found what I was looking for in Edgar Schein's Humble Consulting. Schein's approach articulates very well the way I want to work as an independent consultant. I am going to let these two resources to deliberately percolate together for a while. They've been very useful in allowing to coalesce insights and ideas around my own approach to consulting and the kinds of things I will want to monitor as I start working with clients.